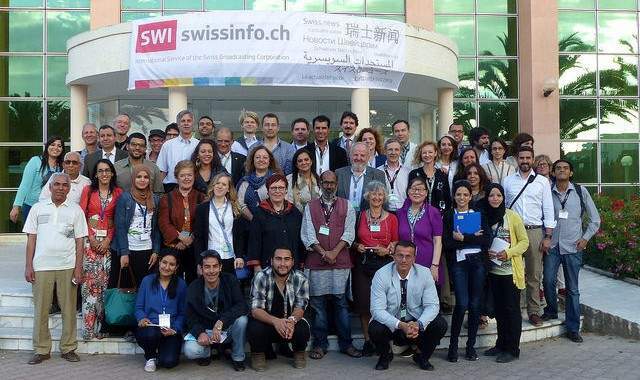 ECAS Director Assya Kavrakova and Kenan Hadzimusic, Senior Manager, Programmes and Fundraising, took an active part in the four day Global Forum on Modern Direct Democracy in Tunis from the 14-17 May 2015. The Forum discussed the advances in democracy in Tunisia and around the world with special emphasis on tools for participatory and direct democracy. In the Tunisian context, many of the interventions tackled the upcoming decentralization process and the necessary reforms which are needed to make it a success. It offered a space for debate with prominent experts in the field on issues ranging from the relation between Islam and democracy, women and democracy, free trade and direct democracy, participative democracy, local democracy and the role of social media. Is there a link between social media and political campaigning? The participants argued that it is possible, although difficult, to reach out of your cocoon and that social media does often reinforce negative stereotypes and hampers an open debate, which is on the antipodes of its “liberating tool” image. Nonetheless, some users of social media do have the reflex to look into the “opposing camp” in order to get an informed opinion. The link of social media with political campaigning was identified in the positive sense, which consists of using it as a tool to initiate critical thinking, political activism, and awareness as well as to mobilise citizens around key democratic fundamentals. On the other side, political parties have become astute users of social media and often use it to manipulate political opinion. In terms of the reliability and the quality of the content of social media, it was seen as something which could not be reached by imposed regulation, as this would conflict with its very nature. It would be almost impossible to impose the same set of rules and deontological principals as those applied by journalists in traditional media. Participants argued that users often know how to recognise content of quality and that specific social media platforms are more prone to publicise reliable information than others. A Tunis declaration was adopted at the end of the Forum, synthesising the main conclusions from the panel discussion and the workshops.